“Pathways To A Centred Body” suggests not just one way to approach the core body, but a variety of tools, practices and explorations to discover and recover an integrated centre. I first came across Donna Farhi’s books back in 2004 and was immediately hooked by her accessible, relevant and inspiring writing and teachings. Since then Donna has become my primary Yoga teacher and I have regularly attended her workshops and teacher trainings, eventually moving on to assisting her on events and intensives. I met and studied with Leila Stuart in 2015 on one of Donna’s Teacher Trainings, and I saw that she too was an exceptionally gifted and knowledgeable teacher. 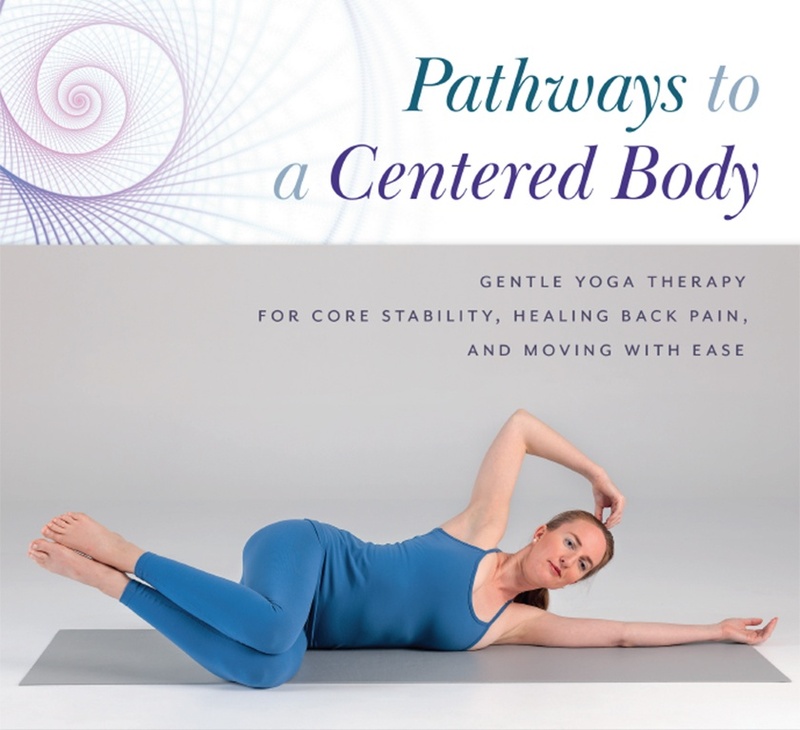 I was very excited when this year they published a book together, “Pathways To A Centered Body”. Yoga, Pilates and the fitness industry are filled with practices focusing on the core of the body. And truly it should be an important part of any movement practice – that we grow the ability to orientate our movement around our centre and from our centre, and to foster an integrated and balanced core. It has certainly become a cornerstone of my own personal practice – to be able to integrate all my limbs (my head and tail as well as my arms and legs) to my core body, to feel and be balanced, stable and centred, and to experience an inter-related wholeness via the connected pathways through my body. However, most of the practices I have come across are concerned with strengthening the core of the body. According to many teachers, strengthening the core of the body will relieve back pain and help with healthy posture. And while this may be true to some extent, there is much more to core integration than strengthening. “Pathways To A Centred Body” is in itself an interesting title as it suggests not just one way to approach the core body, but more a variety of tools, practices and explorations to discover and recover an integrated centre, that also speaks to and acknowledges the individuality of each person. Armed with the latest research at their fingertips, along with decades worth of experience and knowledge, Donna and Leila have created an altogether deeper, more intelligent approach to the centre of the body than simply strengthening core muscles. They have developed a clear, rational protocol to working with the core body. And while, yes, it may indeed be useful to strengthen muscles if they are weak, it is important to look at deeper underlying issues which may give rise to a dysfunctional or unbalanced centre. If we only practice strengthening the core of the body we may well end up simply strengthening an underlying imbalance. One of the key aspects of the book concentrates on connecting to the very deepest of the core muscles – the psoas major (pronounced so-az, with a silent p), which has a unique, multi-dimensional influence on the core of the body. The psoas connects the spine itself, from the lowest thoracic vertebrae, T12, and all the lumbar vertebral bodies and discs, flows down through the pelvis, interweaves with the iliacus on the inside of the pelvis, and attaches down to the lesser trocanter on the top inner thigh bone, the femur. The spine to the legs, the upper body to the lower. A full description of the psoas is beyond this review of course – but the book does this exceedingly well. Whilst not the only book to recognise the importance of the psoas (Liz Koch’s, Core Awareness is another recommended resource), if you do wish to know about the psoas and how to connect with the psoas through movement, this is the book for you! While much of the book is organised around this protocol, there is also a great deal more. The book considers the psoas in great detail, it’s myriad of functions, how it connects to the thoracic diaphragm, our primary breathing muscle, how the psoas is related to spinal stability and pelvic balance, and the holistic aspect of the psoas – its connection to our energetic, emotional and mental well-being. The book is not just about the psoas of course. 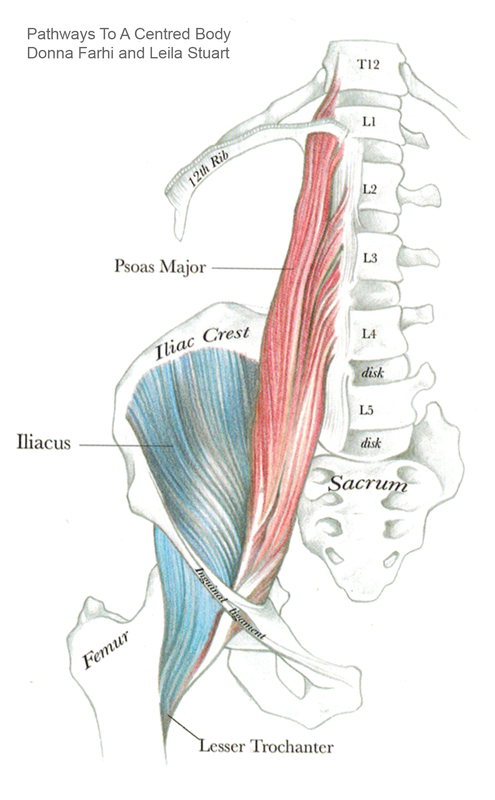 Donna and Leila take a detailed look at the role of other primary core muscles – the thoracic diaphragm, the quadratus lumborum, which is also a deep core muscle that lies in partnership with the psoas, the multifidus (which runs along the back of the spine from the sacrum to the base of the neck), and the pelvic floor. We are offered a whole range practices too, beautifully and clearly explained, outlined and illustrated with super clear drawings and photos, which feature I am delighted to say, my friend and close working colleague, Karla Brodie. I believe that an important aspect of this book, which makes it truly stand out, is that all the practices are readily doable and available to a great majority of people. This is not a book full of challenging plank posture variations or crunches. The practices are subtler than that and are designed, with Donna and Leila’s experience, to work gently, effectively and without pain. Other parts of the book address the thoracic diaphragm and diaphragmatic breathing, the structure and function of the spine, lumbar and pelvic stability, healthy hip mobility and organ support – all important aspects of and pathways to a centred body. Also introduced is the Fig-8 loop – a kinetic image that we can use in practice (and in everyday life) which can help us simultaneously engage all our inner core muscular support, and is an accessible way to find a neutral and stable pelvis and spine, and move whilst feeling grounded, spacious and light. Having attended and been a part of Donna’s workshops and trainings for more than a decade, it is wonderful indeed to see this all this valuable material being made available within this book. Like Donna’s other books, it is beautifully designed, and the pages and the various practices are laid out in a way that invites the reader to follow along and learn effectively and easily. It is a detailed and richly informative book, yet very readable. On the Contemporary Yoga Teacher Training we have already made the book an essential read. In the few months since it was published I have used the book many times as a resource to refer to in creating sequences for classes, workshops and particularly in private one-to-one work. In summary, then, this is a highly recommended book, an essential read for finding clarity and a deeper understanding of the centre of the body, and for those who wish to discover a cohesive, stable, easeful, breathing, connected core through movement. Destined to be an invaluable resource for Yoga educators and practitioners worldwide. Neal has been practicing yoga for eighteen years and teaching since 2003. He sees yoga as a map guiding us home to a place of peace and relaxed openness in each moment. He enjoys creating a safe and inviting space in which to learn and discover yoga as a balance between effort and effortlessness, structural alignment and organic fluidity, mindfulness and spontaneity. Neal teaches as part of the core faculty on the Yoga Teacher Trainings from Contemporary Yoga, based in Auckland. Neal and his colleague Karla Brodie also offer Restorative Yoga Teacher Workshops in New Zealand and Australia. Find out more about Neal on his websites Sacred Moves and Restorative Yoga in New Zealand.